Norman H. Topping’s inauguration as President Fagg’s successor in 1958 began two of the most dynamic decades in USC’s history. Topping established a comprehensive planning commission that in May 1961 produced the “Master Plan for Enterprise and Excellence in Education,” a courageous and forward-looking academic blueprint that included a fundraising goal of $106,675,000 to be raised in 20 years. In fact, the goal was reached and surpassed in little more than five years. The crowning achievement of the Topping years was USC’s election to the Association of American Universities, an organization that today is made up of 63 leading public and private universities. The AAU bases membership on general excellence with an emphasis on graduate and research programs. 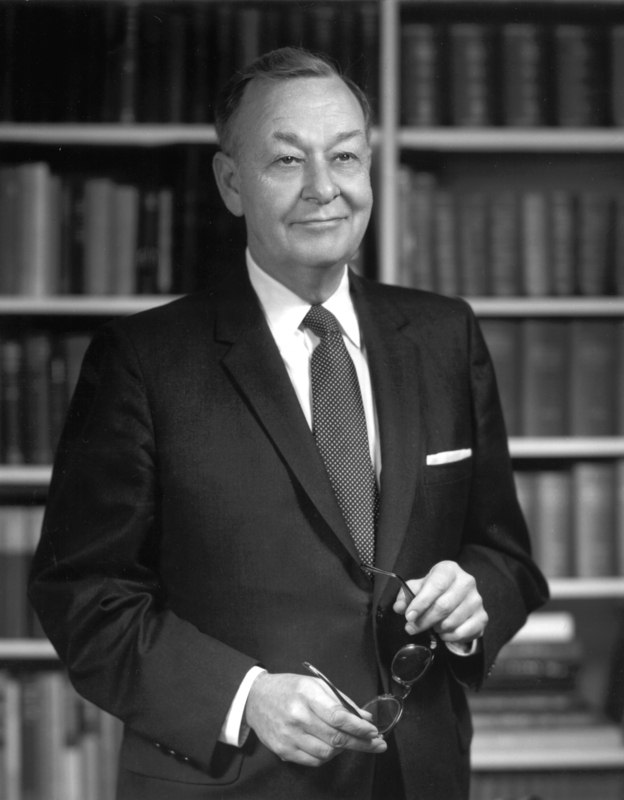 Norman H. Topping B.A. ’33, M.D. ’36, becomes the second USC alumnus (after Marion M. Bovard ’87) to serve as university president. A hypersonic wind tunnel, capable of testing missile models as though they were flying at 20 times the speed of sound and nearly 60 miles above the earth, is put into operation on the University Park campus; the tunnel is the only one of its kind in the world. Then U.S. senator John Fitzgerald Kennedy and Vice President Richard Milhous Nixon speak at USC. The legendary John McKay takes over as USC’s head football coach. Topping announces the “Master Plan for Enterprise and Excellence in Education,” an academic blueprint that doubles the endowment, adds 30 new buildings to the Health Sciences and University Park campuses, and helps the school gain election to the Association of American Universities. Traveler makes his first appearance at a Trojan football game. The Ford Foundation awards a $6.5 million challenge grant to USC — the largest in USC’s history and the largest ever made to support education in Southern California. The Armand Hammer Collection of paintings takes up residence at the USC Fisher Museum of Art. The Gamble House — the “ultimate California bungalow” designed by renowned Arts & Crafts architects Charles and Henry Greene — is deeded to the City of Pasadena in a joint agreement with the USC School of Architecture. USC’s Department of Electrical Engineering joins Mathematics to establish the first program in Southern California leading to the M.S. and Ph.D. degrees in computer science. The Eileen and Kenneth T. Norris Medical Library is completed on the Health Sciences campus. USC is elected to membership in the prestigious Association of American Research Universities. The Center for Urban Affairs is established at USC, offering undergraduate and graduate degrees in urban studies. During the “Days of Concern” (May 7 to 11), USC students and faculty participate in rallies, marches, teach-ins and political canvassing — all unmarred by violence — in symbolic protest of the escalating war in Cambodia. The student-sponsored Norman Topping Student Aid Fund is established.